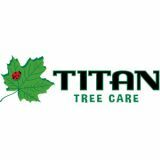 This is the official blog of Titan Tree Care. A new tree is an investment that needs proper care for it to thrive. And if you plant a tree for shade in the hot Arizona desert, you're probably anxious for it to reach mature size. So it’s not surprising that people will do everything they can to get their trees off to a good start. It's common to see people, including landscapers, staking young trees. However, trees seldom need that kind of help. In fact, staking a tree often does more harm than good. Often, staking ends up damaging a tree, largely because the staking is done improperly or left too long. Staking trees improperly is one of the leading causes of tree death in urban yards. In many cases, the ties attaching a tree to a stake cause girdling, which is cutting through a ring of bark around the entire circumference of the trunk. The tie around the tree becomes too tight and basically “strangles” the tree trunk or branch it encircles. Generally speaking, a properly planted tree will not need staking. There are, however, a few situations in which a newly-planted tree will benefit from staking – provided it’s done correctly. Some young trees have heavy leaf cover and small root balls. Since the tree is top heavy, it might benefit from staking for a short time. The heavier top can cause the root ball of the tree to rock underground, and that makes it more difficult for the roots to settle in and grow through the soil. Bare root trees with small root balls also might benefit from temporary staking. Some people stake trees just to protect them from lawn mowers or foot traffic close to the trunk. A lawn mower can bang into tree trunks and damage them. Heavy foot traffic around the base of the trunk can compact the soil, keeping oxygen from reaching the immature roots. But these reasons for staking are better solved other ways. For example, you can place mulch in a circle around the base of the tree or put up a temporary fence (even something as simple as a circle of chicken wire) a few feet out from the trunk on all sides to keep animals and people away from the trunk. Young trees in windy locations can also benefit from temporary staking. And a few tree species might need short-term staking. For example, some species, like acacias and mesquites, tend to be top heavy. Ask a tree care professional to help you select shapes of these and other new trees that are more likely to survive without staking or to perform corrective pruning to ensure that a strong central trunk, or leader, forms as the tree grows. Properly staking a tree can minimize damage. First, determine where the trunk needs steadying and choose a height for your stakes and ties that’s no more than two-thirds of the way up the trunk. Then place two or three wooden or metal stakes on opposite sides of the tree about one and a half feet from the trunk. Be sure to pound the stakes firmly into the ground. Use a flexible and soft material such as rubber tubing, wide cloth belts, or pantyhose (for small trees) to wrap around the tree and tie to the stakes. Wire is the worst material to use; also avoid twine and rope. Tie the tree firmly but leave a little room for movement; too much movement will rub the bark away, too little will slow tree growth and development. It's especially important to monitor how long your tree stays staked. The sooner you remove a stake, the sooner the tree can become strong on its own. Six months to a year usually is long enough to leave a young tree staked (plan to remove stakes at the beginning of the next growing season). Titan Tree Care has two Certified Arborists on staff and over 50 years of tree health experience. Our staff works with the best, state of the art equipment and will tailor the most comprehensive solution for your trees. Thursday, 11 April 2019 Should You Renovate Your Landscape Irrigation System?